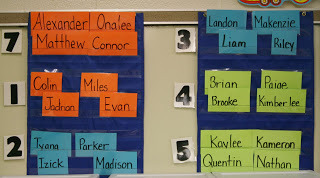 Hands down, my favorite small group activities to happen in my class are math stations. They just run so smoothly, students are so engaged and to be honest, it’s just plain fun. While I’ve used Debbie Diller’s book, Math Work Stations to get me started, of course, I’ve had to tweak it a bit here and there to fit my own classroom. I use a base of nine different stations which students rotate through twice before I typically change them. Even though there are nine stations available, at any given time, only six are being used. 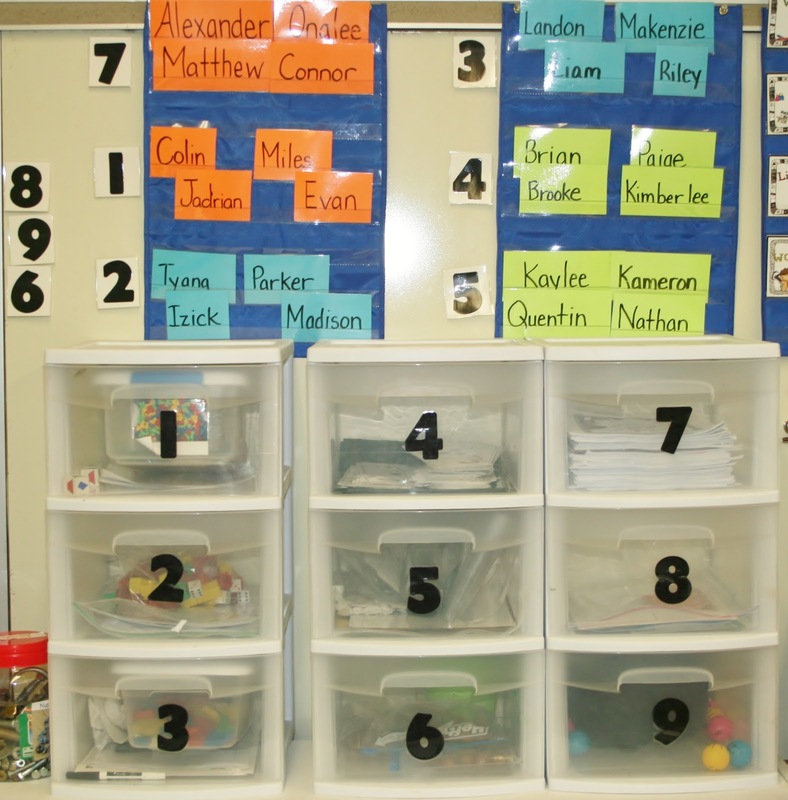 Each drawer is assigned a number and the numbers 1-9 move down through the six groups of students I have. I like this drawer system because it’s neat and there aren’t many activities that can’t be stored easily in them. Plus my students can manage retrieving and putting them back independently. BONUS! The other HUGE addition to my stations I started this year, is to identify a ‘materials handler’ in each group. These are the students who hand out and put away all the objects from an activity. No one else is allowed to grab or handle the materials unless the material manager gives them directions. This has been a MAJOR help in eliminating fighting and bickering over who gets to do what. There are no more than four students at a station and depending on the activity, they either work in pairs, individually or as a group. Because my room is so small, this has been the best system and number for me. 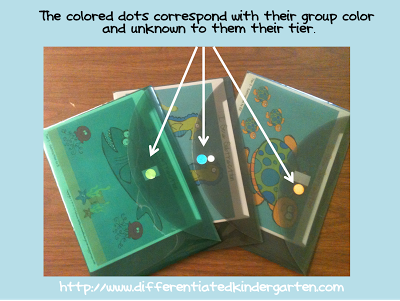 Groups are color coded to help with tiering but are very flexible. 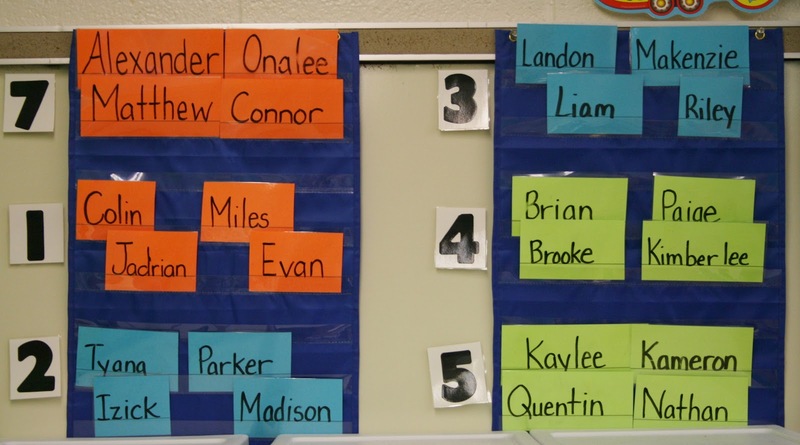 I switch up groups and a students name may be on a different colored tag (that’s why I laminate them) depending on the skills we are working on during a given rotation. 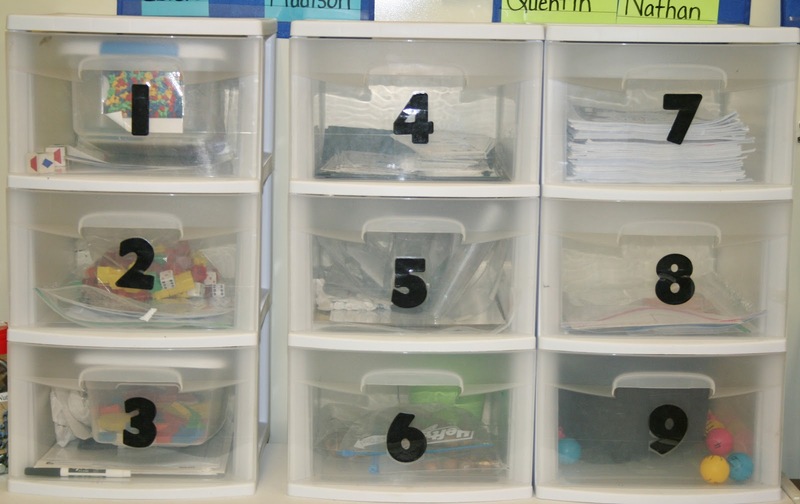 The way the colored systems works is that, if a station is tiered, inside the drawer students will find a corresponding bag or envelope or some kind of similar storage systems with their colored ‘dot’ on it. So for instance, a students who has their name on an orange tag will look for orange dot and use the materials from that envelope. All the students who visit this station will do the same kind of activity, their will just be different materials to meet their level of readiness. 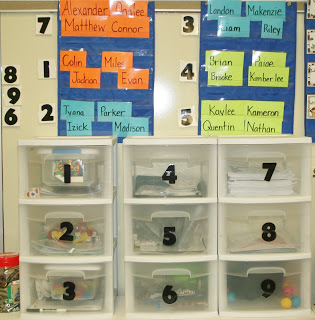 If you look at my math station planning page for math stations it looks something like this . 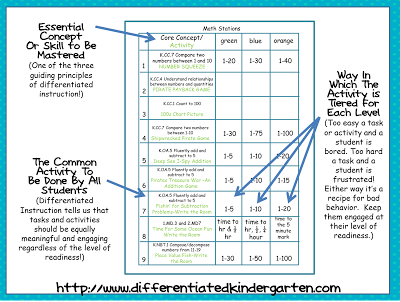 . .
You’ll notice that each station has a place to indicate the ‘core concept or still’ (one of the three guiding principals of differentiated instruction) and then there are three sections where, if the activity is tiered, I can indicate how. If the student’s name is written on a blue card, they would grab the blue envelope, green card green envelope and so on. In each envelope is a recording sheet for a common subtraction write the room activity. The difference is that they will be looking for different cards that correspond with their particular recording sheet and tier. 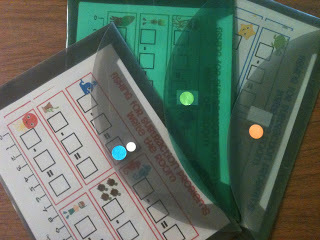 By looking at their recording sheet, they can see that they are looking for either the green, blue or pink bordered cards and corresponding see animals. Surprisingly, they pick up this system very easily and it works like a charm in my tiny little room. Two other things I need to point out. Number one, you’ll notice that I don’t tier EVERY station. No one has that much time. In fact, if you’re just starting out tiering your stations, I would say just start with one or two stations being tiered. See how it works for you and if everything is moving along, if your students are getting the gist of it, add more. And number two: you may notice that station number 8 above is not a kindergarten common core standard. You’re right. It’s not. But in order to make counting by 5s meaningful to my kinders each year, I explain that they need the skill of counting to 5s in order to eventually tell time. It’s a great motivator, but it also means that if they do it, I have to follow through with telling time activities. So that’s why I introduce it (and money) to those kindergarten classes that are ready for it at the end of the year. Now, not to leave you empty handed after this long drawn out explanation of my tiered math station system, I made a simple little Giver Me Yer Treasure Game for you that is tiered and ready for you to put in your own stations. Just click on the picture to get your copy. I hope you like it and if you do, follow my blog, tell your friends to follow me and I promise, I’ll keep making you great activities for differentiating in your own classroom. Looks great. I love how you color code everything. The color coding does work great for my room, but my neighboring teacher has a color-blind student so she has to find a different way for her students. I think you just have to kinda experiment to figure out what works best for you. The planning page really explains what you do so well. BTW I have a huge bag of magnifying glasses on order so I can start using your I spy packs. Thanks Jen. Where did you find the best deal on magnifying glasses by the way? People are always asking me. Found magnifying glasses about 2″ diameter at a dollar store for 1$ each. Thank you so much for showing how you differentiate your centers. I just started doing this and my kindergartners love it! Thank you so much for sharing your expertise!! Misty, thanks for letting me know. Yikes! I have the link fixed now. I certainly appreciate your following through to find it. This is great! I have been looking into making math centers more purposeful so I can teach guided math next year and this post has given me some wonderful direction. The color coding of the activities is genius. Please give it a try. I think you’ll like it. The color coding only works if you don’t have any color-blind students, but when that happens you just adapt. Good luck and let me know how it goes. Wow! This is so well organized and makes me want to try it next year! We are going up to 28 kids in primary grades and I’m going to need to figure out how to differentiate math to help them. Thanks for sharing! I started the year out with 26 doing these so 28 is do-able. I’d love to hear how it goes for you when you get it up and running in the fall. I am making games and bought my organizers, but I know I can’t make all games before school starts in July. 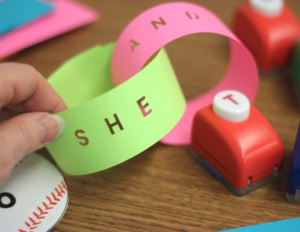 Is it terribly difficult to create games and activities during the school year? Ok, first of all remember not EVERY station needs to be differentiated. At the beginning of the year there is alot of exploring with materials and concepts. Add your differentiated stations slowly. Then of course, check out my freebie page above for all my freebies that you can use and other freebies from other fabulous bloggers and then after all that if you still don’t have time, check out my tpt store. When I’m looking for a specific activity, I usually ask myself how much time it will take me to make it versus buying a product already made. I’m so glad your giving it a go…keep me informed. What a great system!!!! I love how organized it is, I may have to dabble in this next year! Thanks for sharing!! Thanks Cindy. I’ll be sure to stop over and check you out. Amazing! I need to do this with my second graders! Did you actually make and color code all those task cards yourself? It must take you FOREVER, if so! Do you know of any good source for D.I. Lessons for my grade level, or can you recommend anyone to follow? Thanks a million! Some of my things, like the one above and several of my time, addition, place value and subtraction products meet 2nd grade Common Core standards. You can check them out. I have several freebies. Oh I tried buckets but it didn’t work for me for that reason and I couldn’t get everything to fit each time so this system has been really good at fixing those problems. Good luck and let me know how it goes. Thanks Sue, I need to stop by your blog and check you out, too. I enjoyed reading this post! I, too, love my Math Stations and plan to spend some time this summer reviewing Debbie’s book. Thank you for opening your classroom AND sharing your freebie! Love! I love the idea for color coding, I attempted to differientiate my stations ONCE and it failed miserably, so I haven’t thought about it since. After seeing your system, I am hopeful to try it again. Thanks! Please . . . try try again…maybe this will be the year! Love your organization and ideas for differentiation. I use the dots to differentiate students’ writing activities but think it’s a great idea to use them for math as well. I will be doing more math stations next year and can’t wait to use your ideas. You have the BEST ideas and I’m so glad I found your blog. Thank you so much! Wow! Thanks for the kind words. I hope this helps. I’m anxious to hear how it goes for you this fall. Thanks for yet another great freebie!! I love your items!! Thank you for sharing your great organization ideas. I’ve purchased from you before and the kids loved it!! I love this! I found your blog through pinterest! My question is, you said you change the centers after they’ve rotated through them twice. Do they stay the same, but “problems” change, or are the centers completely new every rotation? I do 4-5 centers a week, 1 a day, and it seems like I am ALWAYS explaining to them what to do. That is my question too. I also noticed that your pages are in color – do you print all the sheets in color or are they reusable? Kari, you’ve brought up some GREAT questions. (Makes me think I need to do a follow up post actually). It takes me 3 weeks to rotate through my stations and they spend between 15-20 at each station when we do them. I often have similar ‘types’ of activities when I switch them (i.e. write the room, I-spy, number squeeze . . .) but the skills may change. My students get used to the type of activity but since it’s a different theme or I use different manipulatives and the groups are always flexible and changing, they don’t get bored. Sometimes a station is just for exploration too. Like before I introduce and activity with snapcubes, I make sure they have had time to play with them first so when they have to work with them, they have already had the opportunity to play. Hope this helps. Kristy, I print most of my things in color because that is what is easiest for me. I have a color printer at school and laminator so I like to have students do the work with dry erase marker and erase when done. Once in a while I will print off things for them to write and take home but I love laminating for longer lasting activities. I have also started to add some black and white response sheets with my products when possible for those that don’t have readily available access to a color printer. But my clipart doesn’t always let me do that. It just depends. Also, not every activity has a response sheet in case that’s not clear from my post. I am so glad that I finally follow you!  Great post! I think we should have a secret hand shake anyways! SHAKE, SHAKE, SNAP, CLAP, CLAP, HIP BUMP, TURN, HIP BUMP, JAZZ HANDS! What do you think!? I like the hip bump action FOR SURE! Thank you so much for posting about your math stations. You always have such wonderful ideas and I appreciate how detailed you always are in your posts. Thanks so much. I’m glad you can use the information. You are amazing! Seriously! Thank you so much for your explanation of how you make and organize your stations. You are such a wealth of information and your generosity is incredible! Thank you SO MUCH for sharing all of your wonderful creations! Wow! Thanks! You made my day. I’m glad someone can use this information. Oh my goodness, you are so organized! Thank you for sharing. Differentiating my instruction and tasks for students is an area I need to improve in my classroom. Now I know where to begin! Good luck. Let me know how it works out for you Maria. Do you have a resource that you recommend to teachers that are just beginning in the area of differentiation? I work with teachers of students with special needs and it is like they have never heard of differentiation. If I could give them some resources, that would be helpful. Thanks for the freebie! Absolutely. I think I need to do a post with all my favorite resources. Look for it in the next several days. In the mean time, have them come follow me. I was inspired by your post and created a few math stations that I was able to differentiate due to reading this post. Thank you so much. I can’t wait to see what else I come up with for my classroom. Here is my post that I have you linked into, so others maybe can be inspired like I was. Wow! Thanks for the shout out on your blog. I’m glad you found it helpful. This is great! Thanks for sharing! Questions: Do you have the students rotate through 1 center a day for 20 min? Then the next day they do the second center and so on? How do you keep track of who has done each center? Are your groups ability grouped where all 4 children are working the same activity? I love this system! I am currently a teacher turned stay-at-home-mom. I am now following you even though I won’t be using any of this directly in the classroom for many more years. I am passing your site along to my teacher friends as well. Love it! Thanks so much for sharing! I love, love, love your blog! I am always looking for ways to differentiate activities in my class for the wide range of developmental stages of learning. Thank you for sharing your ideas and resources. I absolutely LOVE this! Would you mind telling me where you got your pocket charts? They don’t appear to be standard size. Thanks so much! Arrr! I love this game! This will go along great with my Pirate unit!! Thank you for putting this together.Another wonderful addition to my math center. I just stumbled on your blog, and I am trying to differentiate in my grade 1 class, I really need to as I teach in an international school and the children’s levels are all over the board. 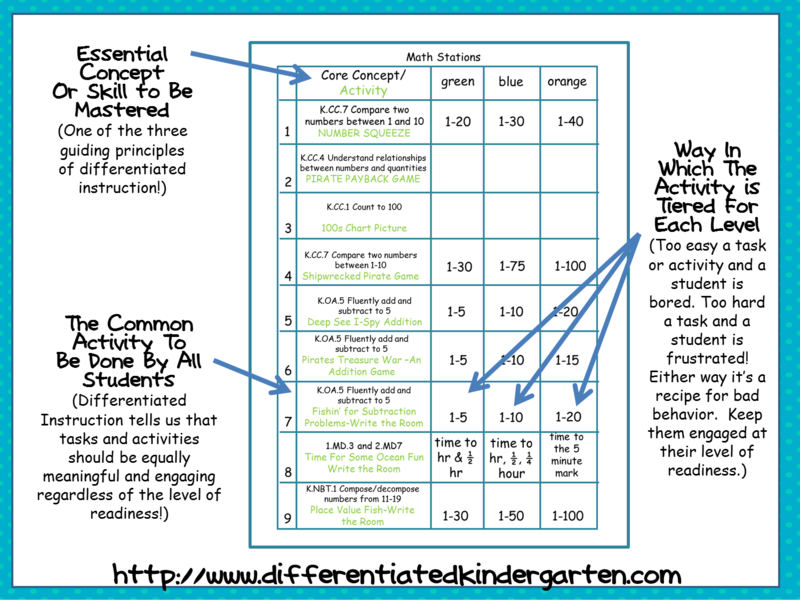 I do centers, but not differentiated at the moment. Would you suggest to start slow, I make various levels of games and have the groups work on those and color code like you do? Do your students visit one station per day? Why do you have 9 centers but only use 6 at a time? How does that work? Thanks!! Love your work! I absolutely love your stuff! 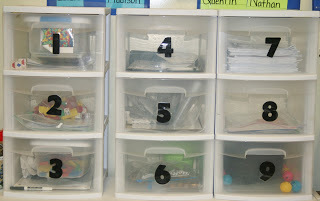 I also have a tiny K classroom so I’m wondering… where and how do you store the materials for math stations when not in use? Thanks for all of the time you put into this blog it is VERY helpful! I am so inspired by you! 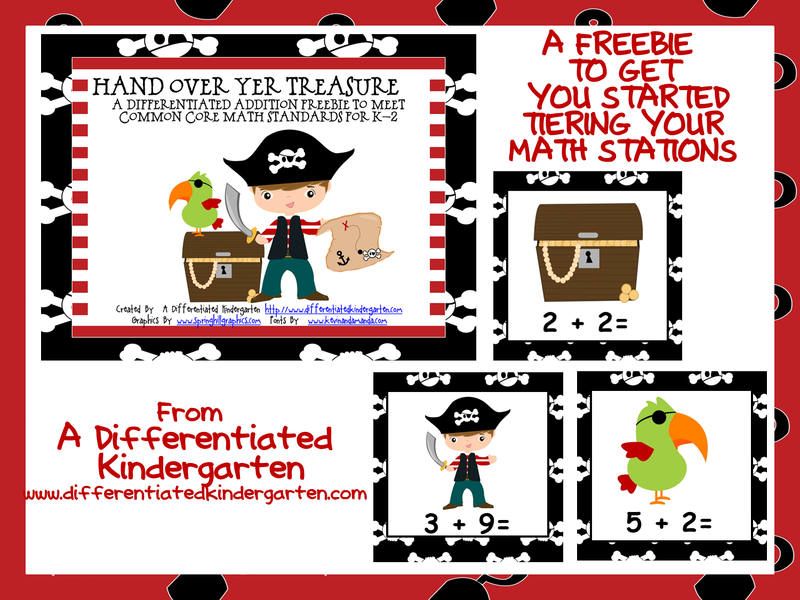 I teach Kindergarten in Iowa and am taking a masters class on differentiated instruction. 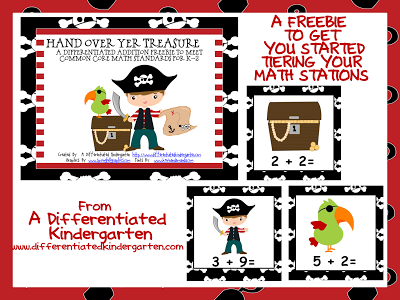 I have you down as a site to check out this summer and base my math centers around. Such a great site and a great teacher!!!! 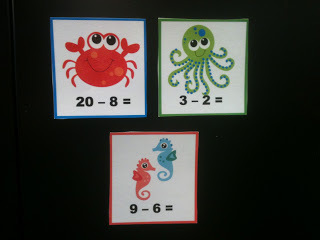 I’m looking into doing math stations this year. I really like your set up, but have a couple of questions. How many centers do they rotate through each day? Do you see groups during this time and do you see each group daily? If you don’t see math groups during this time, do you have a seperate time you pull kids? I struggled with fitting everything in last year and it seems that I have the same problem this year. Thank you for any help you can give!! Also, I love the information and resources you provide on your blog! !